"i just needed to capture his beauty on paper"
One Direction's music, at least amongst its fans, is perhaps best remembered for its dramatic shift in tone and style throughout their five-year, whirlwind tenure. From upbeat and colorful bubblegum pop, to more subdued, but no less energizing, folk and rock-inspired tracks. Much of this was thanks to the musical stylings of Louis Tomlinson and Liam Payne, who took on leadership roles in the writing process. In the later years, Tomlinson's lyrical efforts penned more mature and complex songs, like “No Control,” “Home,” or “Love You Goodbye”. In his writing, Tomlinson was able to imbue the same light, fun energy the group's early music had provided, while allowing their style to grow with their fans. One aspect of art-changes' work that stands out as unique to the style of other fan artists is her creative use of color; each drawing she creates is saturated with fantastic and abstract yellows, blues, purples, and all manner of other bright colors. And, while prior to 2014 she worked primarily with styles traditionally associated with darker palettes, she still experimented with color combinations and blending exercises she had learned in school. Inspired by artists like Wassily Kandinsky and Franz Marc, art-changes is drawn to artwork that stands out and arrests the viewer with its brightness. 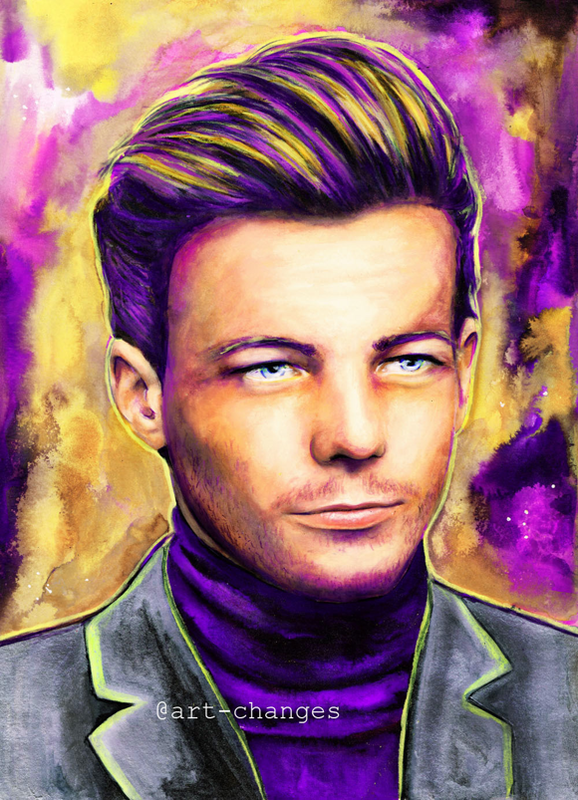 This impulse followed her as she began drawing portraits of One Direction, and although the content shows a remarkable change, from expressionism to realism, this style of creative colors remains. art-changes notes that she was drawn to One Direction, and Tomlinson in particular, because he isn't just a singer to her. She explains, “he's the most wonderful, generous and beautiful human being. He inspires me everyday. Because of all this I enjoy drawing him the most. I love how [his face and body language can be] so expressive. I always love drawing his eyes the most, and his beautiful hair.” She jokes that if she could, she would draw Louis 24/7. Although she is unable to hang it on her wall, it will remain online on her Tumblr, where she is able to share it with her fellow One Direction fans, and indeed, her own fans of her artwork. She has been quite busy recently, but hopes in the future to do more collaborations with fellow artists and content creators, and is excited about the new musical styles Tomlinson will soon be introducing, hoping it will inspire even more artwork of his beautiful face! and for taking the time to be part of our LOUIS IS ART series. Written by Bridget | Edited by Rachel. Who's Who on Two Of Us?